Born on June 30, 1902 in Mexico City. Joined the Academy of San Carlos when he was 15, where he studied with Saturnino Herrán, Leandro Izaguirre and Germaan Gedovius, among others. Later, he attended the Escuela de Pintura al Aire Libre de Chimalistac. In 1921 he formed the group of "The Estridentistas", that opposed conventionalism and academia in art. He collaborated with the Magazine "Horizonte" in Veracruz and during 1928 he also illustrated the cultural magazine "Norte" with drawings and engravings. This year was when he made his first posters of social character and entered leftist political organizations. He published the newspaper "30-30" with Francisco Diaz of Leon, Gabriel Fernandez Ledesma, Fernando Leal and Fermín Revueltas. In 1932 he became head of Drawing at the Department of Bellas Artes of the Secretaria de Educacion Publica. In this building he started an engraving and lithography workshop that was open to the public. A year later he joined in founding the Liga de Escritores y Artistas Revolucionarios. And co founded the Taller de Grafica Popular, thus initiating intense creative work consecrated mainly to engraving, participating in numerous editions by the Workshop. He also became a founding member of the Salon de la Plastica Mexicana. In 1946 he received the Primer Premio Nacional de Grabado. This same year, he left the communist party and with Enrique Ramirez y Ramirez, Jose Revueltas and other personalities, formed the insurgent group "Jose Carlos Mariategui". He made frequent illustrations for this groups newspaper "El Insurgente". 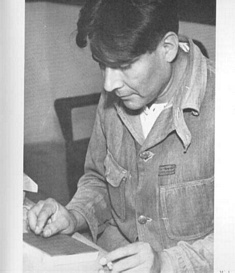 He produced engravings for the films: "Río Escondido" (1947), "El Rebozo de Soledad" (1949), "Memorias de un Mexicano" (1950), "La Rebelión de los Colgados" (1953). A year before, in 1952, had obtained the Premio Internacional de la Paz in Russia and the Premio de Grabado en el Salón de Invierno from the INBA. That year he traveled to the Soviet Union. In 1968 he became a member of the Academy of the Arts of Mexico. He died on February 8, 1969 in Mexico City.